This polyurethane trans mount insert is designed to be pressed into the OEM transmission mount for a 2010-2013 Chevrolet Camaro. It will only fit the TR-6060 manual trans mount. The trans mount insert is made from high grade polyurethane with an 80A hardness. It was molded to perfectly match the inside of a brand new OEM transmission mount. It will significantly stiffen the OEM trans mount creating less slop in the driveline. 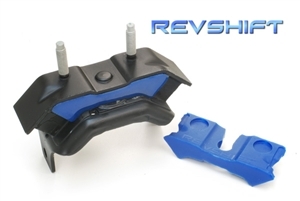 It will improve shifting, prevent sagging, and drastically extend the life of the OEM mount. Don't spend hundreds of dollars on a questionable aftermarket trans mount when you can convert your oem mount to a high performance mount with this insert for a fraction of the cost.